Nokia Suite 3.2: How to export contacts in CSV? 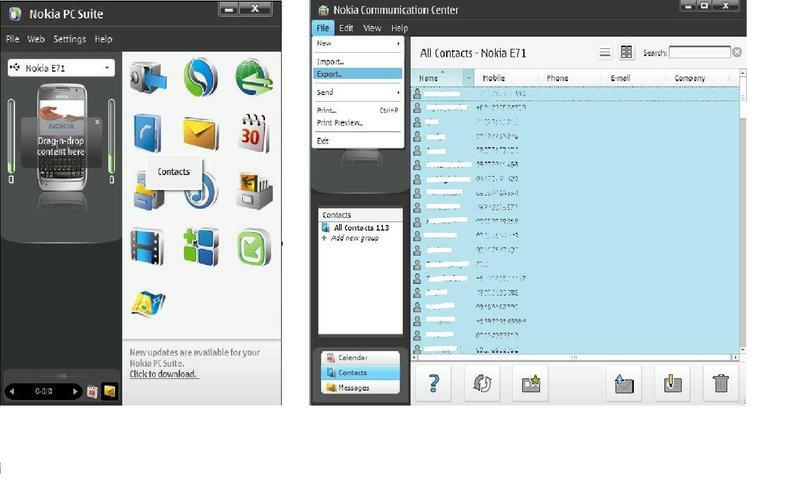 I want to export my Contacts from Nokia Suite 3.2.100 to a CSV file. There is neither any mail software (e.g. Outlook etc) installed on the machine, nor do I wanna use any web app (like Google Sync etc). All I wanna do is a straightforward export to csv. TIA! Really? Nearly a year and no solution? If this actually reflects the Nokia Suite's inability to export in a plain CSV, then this is ridiculously stupid. Nokia used to be very open and friendly in terms of accepting/letting go users from/to other plateforms. Now it is as closed and obsessively protective as Apple. I really didn't expect this. So freakin disappointing..... SO FREAKIN DISAPPOINTING ! ^ Thank you for the reply. But the goal here is a CSV file, not vCards. I already have vCards. I understand that these vCards can be imported in any third party contacts software, but again, why would nokia remove such a basic funtion of exporting as CSV. This option was there in previous suites, but they pulled it away in newer versions. Very unfair, ignoble and backward thinking. Also I tried importing these vCards in Windows Live Mail but it does not import cards with some particular fields. Hi mikehotel86, unfortunately Nokia Suite hasn't ever supported exporting contacts to .csv file. If you have Microsoft Outlook installed, you can sync your contacts from Nokia Suite to Microsoft Outlook and export contacts to .csv file from Microsoft Outlook. I would suggest downloading Nokia PC Suite instead. It has the capability to export contacts directly to a .csv file. For compatibility, you can check here. I was under the impression that the previous versions of Suite will not be available. This solves my problem. Thank you tiny_chef. It is unbelievable that I have to go back to a previous version to get it done. I do not have my Nokia phone anymore, which is why I was trying to export the contacts in backup file as CSV. This previous version has almost all its options disabled since the phone (which I dont have anymore) is not connected. I do not have any other nokia phone either. Is it still possible to import contacts from vCards, backup file into the PC Suite? *The instructions are intended for Outlook 2010. You can search through the website for instructions if you are using a different Outlook version. Nope. I don't use outlook.